PENDULUM FRIESIAN TAIL CLOCK WARMINK 44 CM LONG. PENDULUM FRIESIAN TAIL CLOCK WARMINK 42 CM LONG. 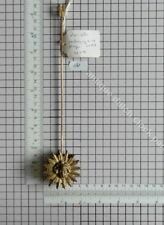 PENDULUM ROD FOR FRIESE OR FRIESIAN TAIL SHORT CASE CLOCK 53 CM OR 20 3/4"
LITTLE SPECIAL NUT TO RATE RIDER OR LENS ON THE PENDULUM ROD.